The images were originally taken at the Harold Arts Residency in 2008. I learned from my dad how to spot an owl: mid-afternoon asleep in the pines beside my house in Iowa, on a snowy peer at the edge of Lake Michigan and soaring above a rail yard in downtown Minneapolis. They make their appearance in Midwestern cities in the middle of winter to feast on mice and backyard birds. On a muggy hot morning the following July, I found myself at the Harold Arts Residency in southeast Ohio staring out the window of my studio at a plaster owl perched atop a stump. I decided to photograph the fake plaster owl over the course of the day and was stunned to see it transformed by the light into a luminous statue of a majestic bird facing down the impending shadows. 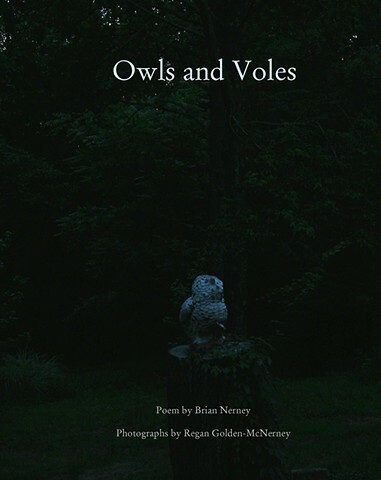 Cover, "Owls and Voles," published by Drawn Lots Press.